Apples are the most commonly eaten fruit in the United States. Apples are a good source of a variety of vitamins. They have a distinct taste, and a crisp, hearty texture. 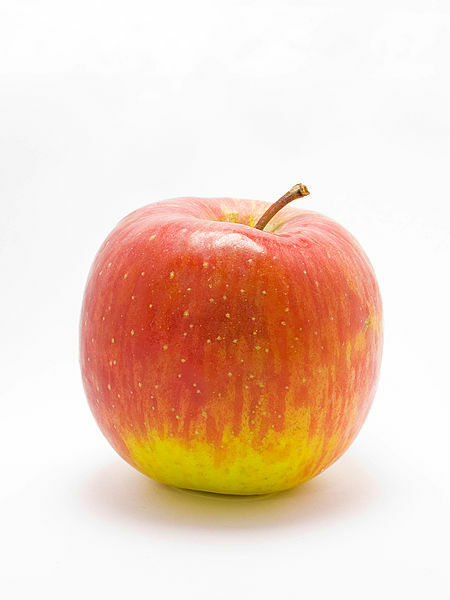 Apples come in a variety of types; in North Carolina the most available are Arkansas Black, Pink Lady, and Limbertwig. Arkansas Black apples are deep red to burgundy in color and fairly flattened shaped. They are tart; and mellow and darken as they ripen. Pink Lady apples have a blush, pink color with splashes of green. They are tart and crisp. Limbertwig apples are tender and juicy, with a tart taste. They look similar to Pink Lady apples, but are darker. Apples are best stored in the refrigerator—if left out, apples will rot quickly. Store in a bag in the crisper bin between 32 to 36 degrees F. Apples can last for several weeks up to several months depending on the variety. Apples are usually eaten raw, but can be cooked—if cooked, it does lose some of its nutrients. Eat whole or chopped and mixed into a salad. If cooking apples, try mixing them with cinnamon and honey for a yummy dessert, or as filling in a pie! Choose apples with little to no discoloration or soft spots. Darkening or spots can signal past-ripen or rottenness. Apples should be firm, crisp, and undamaged. High in boron, a nutrient that helps protect bones and supports bone strength. Good source of vitamin A, vitamin C and antioxidants. Apples are normally harvested in late fall, but can be found throughout the winter and spring thanks to their long storage life. Apple trees take years to mature and require cold nights to develop healthy blossoms that then become apples. Once ripe, apples are picked, often by hand. Apple Salad—chop apples into bite-sized pieces. Mix with vanilla yogurt, toasted pecans, and a dash of cinnamon and nutmeg. Serve cold. P.B. & A. (Peanut Butter & Apple)—Easy, nutritious, & delicious snack. Top apple slices with spoonful of favorite nut butter and enjoy!